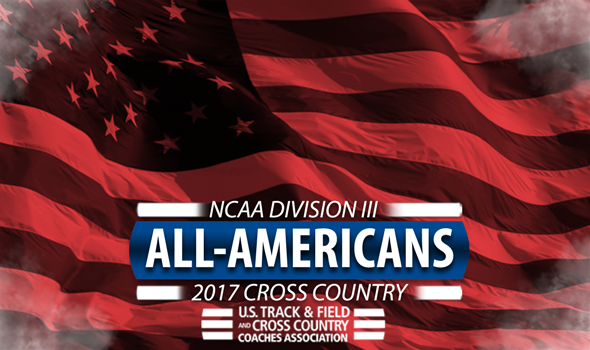 NEW ORLEANS – All-Americans for the 2017 NCAA Division III Cross Country season were announced Monday by the U.S. Track & Field and Cross Country Coaches Association (USTFCCCA). Athletes of member coaches who finished in the top-40 of their respective races this past weekend at the 2017 NCAA Division III Cross Country Championships in Elsah, Illinois earned the honor. The USTFCCCA increased the number of All-Americans in NCAA Division III from 35 to 40 starting this year. The North Central (Ill.) men and Johns Hopkins women continued their dominant team runs as they won their respective titles. UW-Eau Claire’s Darin Lau and Chicago’s Khia Kurtenbach nabbed the individual crowns. North Central (Ill.) was the only team this year to have four All-Americans. The Cardinals won by 139 points and saw Jared Borowsky (second), Dhruvil Patel (third) and Al Baldonado (eighth) finish in the top-10. Johns Hopkins was one of three teams with three All-Americans. The Blue Jays – who won by 95 points – were joined by the Christopher Newport men and UW-Eau Claire women in that regard. Upperclassmen were all over the lists as there were 37 seniors and 30 juniors honored compared to just nine sophomores and four freshmen. Those freshmen were Coast Guard’s Kaitlyn Mooney, Johns Hopkins’ Therese Olshanski and Wheaton (Ill.)’s Hannah Roeske and the aforementioned Borowsky. On the conference level, the NESCAC had the most honorees with 10, of which six finished in the top-40 of the women’s race. The UAA and WIAC each had nine All-Americans between them. See below for a full list of NCAA Division III Cross Country All-Americans.